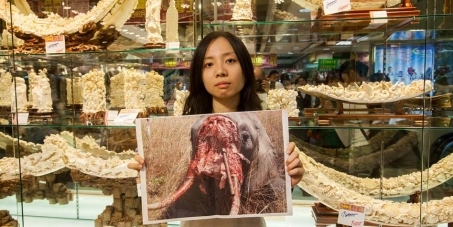 Hong Kong Government - Ban Ivory Sales Now! This petition has been created by Nellie Shute, Christina Seigrist, Lucy Skrine, Illeana Li and Tommy Tsui (in no particular order) . and may not represent the views of the Avaaz community. Nellie Shute, Christina Seigrist, Lucy Skrine, Illeana Li and Tommy Tsui (in no particular order) . Tthe blame for the elephant poaching crisis of the 1980s, which resulted in the global ivory ban of 1989, can be laid squarely at the feet of the Hong Kong ivory traders. And now they’re at it again. At a time when it has been scientifically proven that Africa lost 100,000 elephants from 2010 through 2012, no one in Hong Kong is questioning why the city’s ivory traders are still clinging onto their old stocks of ivory, which should have been depleted long ago. And that's why our groups have recently been staging protests outside some of the city's last remaining stores that still openly sell elephant ivory. We are 99% sure that these stores are selling ivory sourced from illegally-killed elephants. It doesn't take a genius to figure out that Hong Kong ivory traders are topping up their supposed legal stocks with freshly poached ivory from Africa. It’s a moral outrage that these old men, who have had more than 25 years to clear out their pre-1989 ban ivory stocks, are still holding onto them. We believe the city's ivory traders topping up their existing stocks of pre-1989 convention ivory with freshly poached African elephant ivory smuggled from African ports undetected into the port of Hong Kong by container ship. Of course much of the ivory smuggled into Hong Kong is bound for mainland China, but we believe a substantial amount remains in Hong Kong - ready to be sold out illegally in our city with such lax controls on the trade. The increasing amount of ivory seizures intercepted by the Hong Kong Customs & Excise Department with alarming and increasing regularity at Hong Kong’s port and airport would seem to suggest as much. It’s a mystery to wildlife conservationists and animal welfare advocates in Hong Kong that with such high demand from the surging number of Chinese tourists coming here, many of whom have woefully low awareness of the poaching crisis in Africa, the total amount of “legal” ivory in the hands of the trade has barely moved more than a few kilos in the past three years. According to Hong Kong government statistics, it was 116.5 tonnes in 2011, 118.7 tonnes in 2012, and 117.1 tonnes in 2013. Why isn’t this stockpile going down? It’s an open secret that many tourists who come to Hong Kong smuggle ivory products back home. Wildlife crime is still not being taken seriously in this Special Administrative Region of the People’s Republic of China. Fines and penalties for ivory trafficking remain low, as can be seen by the paltry, “slap-on-the-wrist” sentences of six months handed down by a Hong Kong magistrate to 16 Vietnamese ivory traffickers caught red-handed at Hong Kong airport in June. Let’s be clear: Hong Kong people aren’t buying this stuff. Tourists are indirectly fuelling an ivory trade that forms an integral part of the global illegal wildlife trade—the fourth largest type of illegal trafficking after drugs, arms, and human beings. Hong Kong is not immune from the scourge of terrorism, and many consumers are unaware that by buying an ivory trinket from a store in Mong Kok, Sheung Wan, or North Point, they could just be financing terrorist militias in Africa like Al-Shabaab, Boko Haram, or Lord’s Resistance Army. The unfolding crisis affecting Africa’s iconic megafauna is a cause for concern for all, and Hong Kong does have a role to play as a responsible global player. Unfortunately, these days it is not only the sharks that we need to look out for. We also need each and everyone to top buying ivory. The Hong Kong government could do so much more to raise awareness about this urgent issue. They could do a lot worse than start by legislating an ivory trade ban to save the magnificent African elephant before it’s too late. If you would like to know more please visit 'Hong Kong for Elephants' on Facebook or Twitter.